NATO released photographs on Thursday that it said shows Russian artillery units operating in Ukraine, and asserted that more than 1,000 Russian soldiers had now joined the separatists fighting there against the Ukrainian armed forces. 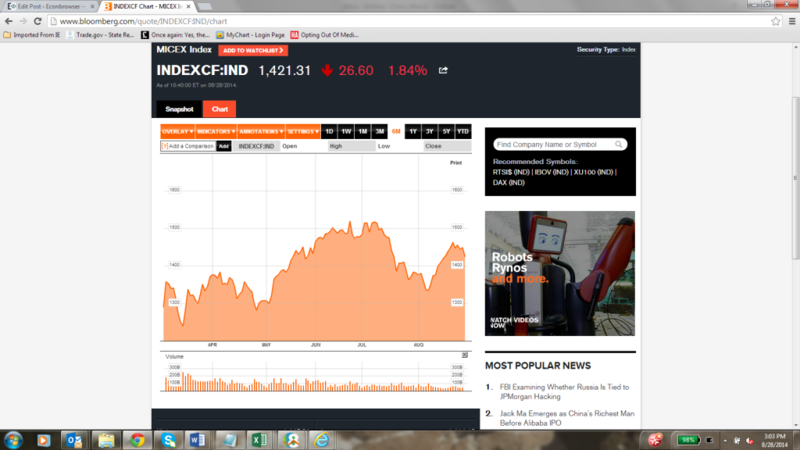 The MICEX is down 1.84% today; the Russian Trading System Cash Index is down 3.43%. Thus far, risk indicators such as VIX are not evidencing upward spikes, but that could change very quickly. Given the downturn in Western Europe — partly attributable in Germany to the slowdown in exports to Russia  — this is unwelcome news for those who are looking forward to recovery in Europe. This development certainly places greater emphasis on expansionary monetary policy, and relaxation of contractionary fiscal policies. This entry was posted on August 28, 2014 by Menzie Chinn. there is no “downturn” in Europe, just a little slow growth. This whole GDP (growth) fetishism. This is absolutely no reason to relax on fiscal treaty obligations. The VIX ain’t what it once was. You might want to look for other measures of risk. Big jump in defense spending to come, eh? He needs to step aside. Short version of what is going on with comments in brackets from one friend of mine. to start whatever war they are starting to depose USA and their currency. Again, it might be the last move in debt based money supply world, and it might be not as productive as hoped, i.e. unsuccessful economically as there is no more room for debt expansion soon ( I guess bankers know this better then us ) , but they are still going with it because it is very important what power who has when the debt extravagance we live in starts to contract. And I think they still see potential to expand with one more war. We don’t have a strategy yet…. But don’t worry, John Kerry will be sent to work on it. Apparently, Hillary Clinton will republish her book and title it “Bad Choices.” Blame it on Bush… whatever “it” is. Also, UAE and Egypt bomb Libyan Islamists without telling the USA. But Barack’s putting is really getting better. barrack putts and w bush cuts brush on the ranch. what is your point? 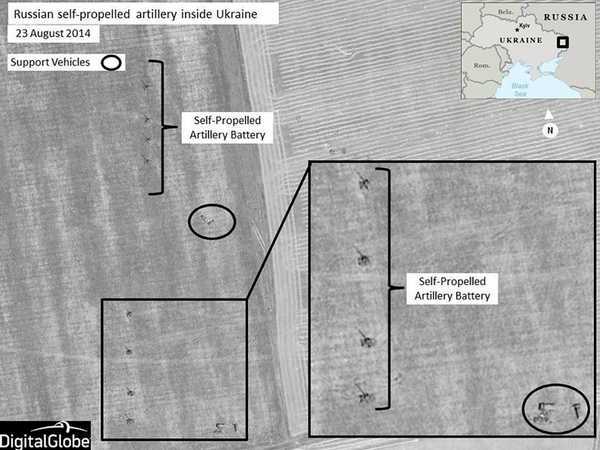 The positioning of self-propelled artillery is interesting. It’s in a battery dependent posture for triangulation suggesting that Russian indirect fire doctrine has not advanced since Borodino. This is the kind of positioning you would expect from towed artillery, not self-propelled. Steven Kopits I’m worried about your mental health. A few weeks ago I read “A Mad Catastrophe”about the Dual Monarchy and WW1. The Austrians were incompetent and the Hungarians were malevolent. Your comments seem to see war with Russia as inevitable and something that is best done sooner rather than later. I think your inner Habsburg is showing. As for Russians, Hungarians have very up close and personal experience with Russians, and to this day, Hungary suffers the repercussions of Soviet occupation. Civil society was not restored after the fall of communism, and restoring it may take a hundred years, or like Latin America, may never occur. Russians understand power. They understand hierarchy. I can assure you, Putin would not care to take on a combination of US airpower and German armor. Push it all in, and Putin would back down. On the other hand, to declare that Russia has some natural right to Ukraine, Belarus and Kazakhstan invites invasion. I do not belief Russia has such a natural right to these or Estonia, or Latvia, or Lithuania, or Poland, or Hungary. Or east Germany. Personally, I think Putin is about the best the Russians are likely to get. But he has to be contained. He is a little dictator; let’s not dress him up as more. Russia could not beat the Germans alone. It could certainly not best the combined forces of Germany, the US, the UK and France (before it switches sides). The real risk, as ever, is that democracies take some time to make up their minds, and while they do so, dictators can labor under the impression that they have a free hand. Do you think Merkel is really willing to countenance the complete fall of Ukraine? (There will be no natural stopping point for Putin before that.) Her reputation, like Chamberlin’s, is likely to be destroyed in the process. Do you think there’s a risk that, at some point, Germany will draw a line and mean it? We’ve already seen with ISIS that our opponents can draw us back into a theater where we’ve (stupidly) promised ‘no boots on the ground’. Now King Abdullah is saying that ISIS will attack Europe within a month; the US within two months? What would you have us do then? So, there is a real risk that western leaders are as wavering as Putin thinks. But that works both ways! No boots on the ground can unexpectedly morph into boots on the ground, and then you have yourself a real war. And I think that’s the most likely outcome, a war of our own creation, because we drew an opponent into a war which he would have avoided had he known our ultimate disposition. Galtieri and the Falklands are a good example of this. So, I don’t understand your position. Are you for appeasement? How did that work out last time? So where’s your red line, Slugs? Ukraine? Belarus? Estonia? East Germany? When are you willing to put skin in the game? Personally, I am confident that Putin could be (have been) deterred. His stealth invasion tells us that. If you’re willing to fight a war you think you can win, you don’t need to send soldiers over the border in disguise. He did not want an open war with Europe. Now, he believes that the US and Europe have given him a green light to invade the rest of Ukraine, at a minimum. Do you think he really has a green light? Personally, I have my doubts. But he’ll be well past the intersection by the time the cop blows the whistle to stop him, having decided that, well, the light really should have been red all along. I find it odd that no one has bothered to mention the simple fact that the risks involved with having any military confrontation with a nuclear capable country is far too large to be worth it. A very basic realpolitik fact of life since 1948 – reinforced and clarified in 1962. Which is why nuclear proliferation has occurred over the decades, slowly, fitfully, but still happening. I do come here for economics, and not for militaria. I did that 30 years ago. As the IISS says, there is no proof, from whom, where, and when this picture is taken. Remember the last time, about the MH17 and the bug system? Turned out that the carrier with the missing rocket was pictured before a car dealership on Kiev held territory. The Air traffic controller tapes are still not handed over by the Kiev folks. The Ukraine had the whole sortiment of T62s , T64, T72, T80s. And it had until last year a military draft. That means plenty of men trained to operate all that stuff. Now the Kiev regime apparently controls very little of the tanks,and the people who can use them. Making it obvious, that the rebels have access to plenty of both, tanks and people. A lot of bruhaha about the 10 russian soldiers caught in East Ukraine, very little talk about the 64 Kiev soldiers caught in Russia, who were today exchanged for them. Forget about one tank with an outside upgrade kit of reactive armor, which looks like a version not known to be owned by Kiev. A structural change, like one more roll, or anything requiring substantial chassis work, that could be taken more serious. Don’t you know that sanctions are really causing problems for Russia. I mean they could have sent 5,000 troops into Ukarine and they only sent 1,000. Oh, I’m sorry, those soldiers in their military garb were simply on vacation – i would guess a little recreational hunting – and they simply lost their way and stumbled into Ukarine. And since they did, why not get in a little hunting with tanks and artillery. Man that will bring down a goose! But it is good to know that “a military response would not resolve either situation.” Perhaps if President Obama would play a round of golf with Putin he could explain this. I am sure Putin would understand if it was just explained properly. Wouldn’t he?